Well writing about a movie that generations has reviewed, watched and liked is not so easy. THe movie has been voted (though controversially) the best movie ever created. I will hear attempt to review a movie the way I found it. Well I almost watched the movie twice. First day when i watched the movie, I found it boring, because since 1941 there has been hundreds of such movies in tens of languages that has said the same story as this. I did not find anything new, I did not find anything different, and I made up my mind that this movie cannot get anything more than a 2*. Well, just after that I tried to find why then, is the world going ga ga over this movie. And the reasons that I read, made me watch the movie again. 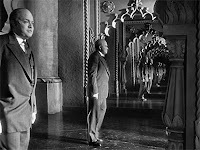 And I really found the technical brilliance of Orson Welles shine through Citizen Kane. Definitely one of the best made movies ever. My apologies ot welles for not getting this correct the first time. Well before we go to the story, let me just give you the back ground of the times when this movie was made. During the second world war, at the time of rise of America as a super power. At times when the technology of movie making was not completely developed. At times when the directors had vision but the equipments never supported it to create a masterpiece. Orson Welles in those days came up with a hard effor putting everything in every shot of the movie, making it look as beautiful as movies in the times to come. 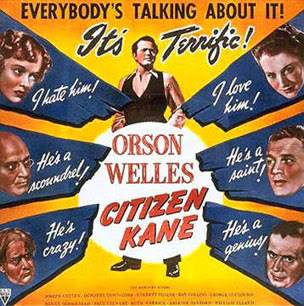 This is an all American film, about an American of great reputation, Charles Foster Kane (Played by Orson Welles himself). He is a legendary newspaper Icon, who even after having all the riches in the world, making the 2nd biggest man made creation on earth, his palace Xanadu, is a lonely man at his death bed. The movie starts with the "No Tresspassing" board along side a big "K" and Xanadu. The movie starts with the death of Charles Kane. And within in the first 8 min of the movie you learn everything about Charles Kane through the newspaper headlines that swamps the screen. The last words of the man dying in the big palace alone were "Rose bud"
A news reporter, Thompson (William Alland) believes that there definitely is a mystery behind his last words and goes on in search of the solution to the mystery. The story of Charlie Kane unfolds as he moves on to interview people close to Mr.Kane. Each interview leading to a flash back showing a part of the legendary life of Mr. Kane. 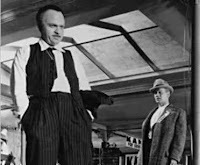 First he interviews Mr. Thatcher (George Colouris), who talks about the childhood or Charles Foster Kane, and how he was forced to leave his mother whom he so dearly loved. 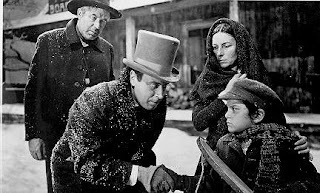 It is this love of her mother (Agnes Moorehead) that he longs for all his life and fails to get even when he is dying. 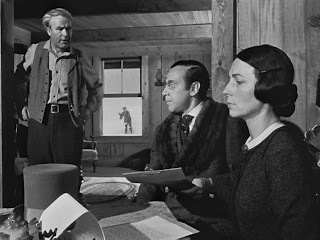 The movie then moves on in a non-chronological sequences of Charles Kane's life. Then the movie goes on through the interviews of Kane's Second wife Susan Alexander (Dorothy Comingore), Kane's personal business manager Mr.Bernstein (Everett Sloane), his best friend Jeddiah Leland (Joseph Cotten) and his butler Raymond (Paul Stewart). Each flash back taking us through the life of the great Kane. How he choses as he grows to run a newspaper out of all the business he inherits, as he says that "Running a newspaper will be fun". He then turns to making profit anyhow, which makes him controversial with his yellow journalism and the news paper soars in popularity. He hires the best journalists for his paper. He marries the niece of the president, Emily Monroe Norton (Ruth Warrick). He moves on to the second phase of his life, that of popularity and controversy. He Runs for the election of Governor. Loses for him involvement with a struggling singer, who goes on to become his second wife Susan Alexander. Kane's personality, dominates Susan's aspiration, he wants her to become a big Opera singer and wants her to be happy in the way he thinks she will be happy. This very nature of Charles Kane destroys their relationship. Her singing career drowns with Kane's best friend Lealand writing a "weak" review about, and he firing Leland for doing that. As Charles builds a huge palace ( which Susan later says to be a 49000 acre of scenery and statues) to satisfy his ego, but still is not able to make Susan happy. She is lonely in a big place, having no one but a work-obsessed partner, who wants her to live the life that he has decided for her. She leaves him in the end. And Kane is left all alone ironically in a Xanadu. And he dies alone in that big place. 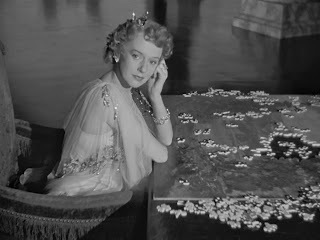 All the interviews put together could not solve the puzzle of "Rosebud" for thompson, and he finally decides that this will always remain a secret. The last scene of the movie that shows the old Sled that Kane had in his childhood when he was with his Mother being burnt, and on it is written "Rosebud". This solves the mystery of what he missed on his death bed, what did he long for. 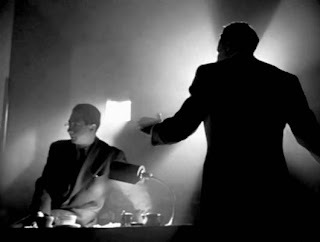 Orson Welles shines in all the department that he puts his hands on : Direction, Production, Acting, Story, Screenplay. It is his movie. Well, everyone in each faculty of the movie performs brilliantly. The actors sufficiently supports the story with their acting. 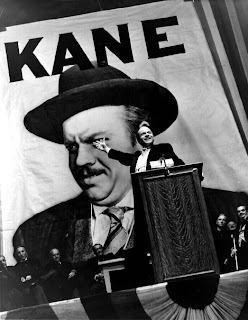 Orson Welles shines as Charles Kane. 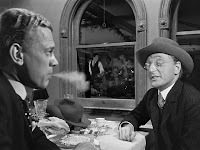 Joseph Cotten's and Everett Sloane's act were neat and noteworthy. Well, the movie as much belonged to the people behind the camera as to the one onscreen. One of the greatest Cinematography of its time by Gregg Toland, bringing innovation to everything that they did. Teaching for the years to come, the art of film making to the generations who learns film making there on. Editing too, by Robert wise was top grade. Music by Bernard Hermann was good with outdoor scenes showing good loud happy music and the indoor gloom of Xanadu captured with silence. Make up by Mel Berns, must have been the best in times as the same actors transcends age easily. Details were taken care to an extent that hazy contact lenses were used to show Leland's aging. Sets prepared and the techniques used to show the grandeur of the movie was absolutely superb. All the department of visuals, special effects, sounds and screenplay shows an effort that was never put in before 1941, when the movie was made. It was as if the art of movie making was rediscovered with Citizen Kane. Well the list of Innovations that the movie achieved was unbelievable. Am trying to list a few here. 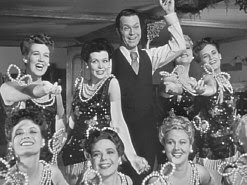 The most important technique that Tolland popularized with this movie and for which the movie is known is the extensive use of Deep Focus. In every scene, with the sharp focus you can see all the parts of the screen. The focus is not just in the central part. For example this scene in the first narration. Look at the young kane playing in the background. The same is also clear in almost all the scenes showing glasses, bottles etc. in the front and the main scene going on in the back, with focus on all of it. Other important innovation was in the area of camera work was the feeling where it almost looked as if they have used Zoom, where as zoom was not available in the equipments then. A great use of glasses and mirrors can be seen through out the movie to enhance the effect of the movie. You can especially feel this in the last scenes when Kane is left alone. Use of glasses can also clearly be seen in the song. (There were no computers in those age to give this impressions). More important was the use of optical printers to layer one piece of scene on another as the movie transceds back and forth from the interview to the flash backs. Generally the movies then were shot in sound stages which did not have any roofs and hence the low camera shots were never tried. This was the first movie which shows many low camera shots (camera kept at a knee level) through out the movie. Extreme Closeups was an art of shooting introduced with this movie. Sound innovations, overalapping of sounds and dialogues , “Lightning mix” a technique to connect scenes through set of sounds were all introduced to movie making through this movie. 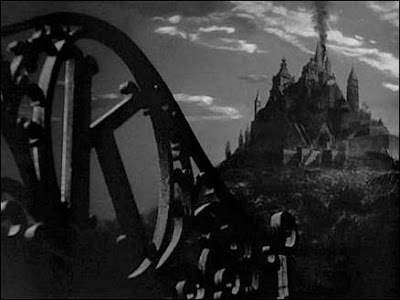 The movie pioneered the technique of putting the audio ahead of the visual in scene to make the soothing transitions between the scenes. Use of lighting too was great. Especially for thompson, who tries to become the eye of the viewer as he interviews the characters. Most of the time his back was shown to the camera and whenver his face was shown it was kept in darkness. This makes it easy for viewers to palce themselves in his position. Brilliant. Trailer of the movie was as innovative as the movie itself. with Orsen welles the most famous voice on radio then, anchoring it. Another Important Innovation was the start of Auteur Theory with the movie, where a movie is considered to be rightful creation of the director. Its his vision and creation. Its' Orson Welles' Citizen Kane. Still after all this, the movie failed when it was released, though now it is a master piece. I understand that the reason would be the same which I felt while watching the movie for the first time. Firstly, the movie went on becoming slightly borring. I did not find the narrative to be gripping. Secondly, the story did not move around thompson talking about Rosebud, which I thought was kept as a key theme at the begining. Even the end leaves you with discontent over the mystery. Thirdly, now in this age, after all the techiniques that were used for the first time then been used, and hundereds of stories done on the same lines, the movie becomes slightly irrelevant. Lastly, the technical brilliance might not be appreciated by the viewer, they require more than that to watch a movie. Overall for the technical brilliance ,which definetely was worth a 5*,, the narrative and relevance in present times, drags the film to a 3.5*. But for people learning filmmaking this movie any day would be a masterpiece with a 5* learning from it.